Hello, I'm Gregor and I put this site together. 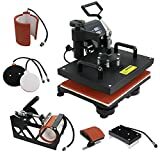 At first, you'll find an overview of recommended t-shirt heat presses, followed by a public poll and a general buying guide on t-shirt heat press. 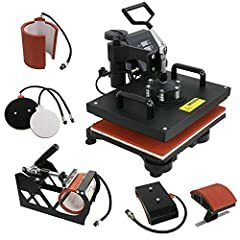 Further down on this page, we do link to other well-written articles and reviews about t-shirt heat presses. At last, you'll be able to weight in your own opinion in the comments section. 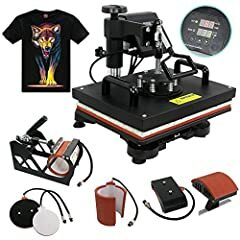 If you also want to vote on the best t-shirt heat press, click here to view the poll. Have you ever wanted to create your own T-shirts or other printed products? T-Shirt heat presses combine heat and pressure to transfer designs that you have created (or purchased) onto a T-shirt and other items, such as tote bags, baseball caps and even mouse pads. A small business can use one of these presses to create products for sale or for use internally. Families can also use them to create their own personalized clothes. Clamshell heat presses get their name because they open just like a clam shell. They have two plates, and to transfer the design onto the garment you lower one of the plates onto the other. 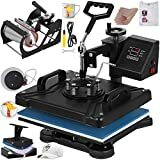 These presses are considered good for those who are just starting out. They work well for standard T-shirts, but they might not be a good choice if you want to apply designs to thicker garments, as there is limited space between the plates. Clamshell press can also be dangerous, too, as you can severely burn yourself if you happen to touch the plate while applying a design. Swing away heat presses are safer than clamshell presses because you place your garment on the machine without having to worry about touching the hot upper plate, which you swing away from you before prepping the garment. These devices will also allow you to work faster than a clamshell. On the down side, they take up more room than a clamshell. A draw heat press places the lower plate in something similar to drawer. 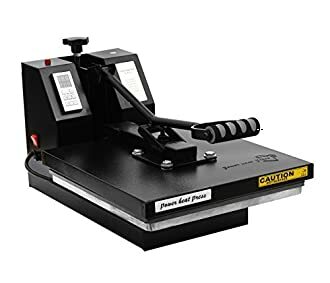 Like with a swing away heat press, these presses protect you from burning yourself. The drawback of these presses is that — unlike with clamshell and swing away presses — the lower plate moves. So have to be careful when positioning the design on top of the garment. They are also bigger than a clamshell press. 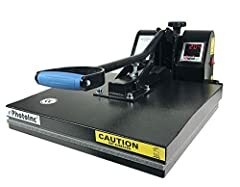 With manual heat presses, you must open and close the device yourself, though they have buttons or knobs that let you set both the pressure and the temperature of the press. They may also come with timers so that you know how long to press the item. Both clamshell and swing away heat presses can be manual. 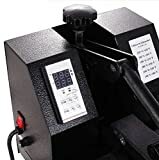 An automatic heat press, which is also known as a hydraulic or a vacuum press, is a digital device that controls heat and pressure so that you apply the design perfectly. You can find both clamshell and swing away presses that are automatic. Size relates to both the amount of space you have available for the device and the size of the garments you will be using. If you are certain that you will never be pressing anything larger than standard-size T-shirts, a small press, such as a 9" by 12" one should work fine. But if you have any doubts, you might want to buy a larger press, such as a 16" by 20" press. 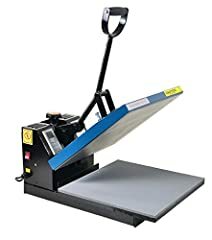 If you are going to buy a T-shirt heat press for business purposes, you are probably going to want one that is both durable and capable of producing a large amount of garments. But if this is just a hobby, a simple inexpensive device may be your best bet. Not all products made from heat presses are the same. Some use vinyl transfers, while other use ink transfer paper, sublimation paper or plastisol. Each of these methods produces different effects. You should know what kind of effects you want to produce before you buy the device, and then make sure that the device is capable of producing these effects. Once you understand exactly what you want to produce and how you can produce it, it will be much easier for you to decide what machine to buy. There are T-shirt heat presses for just about every budget. You can buy an inexpensive machine for a few hundred dollars or purchase a professional one for a few thousand. There are also lots of options in between. The more you pay, the better quality you will likely get, and the more options you will have when using one. Also, in general, more expensive models will allow you produce more garments faster, and they will do so more accurately. Not all materials (both the garment and the transfer) require the same amount of pressure, temperature and time. Make sure that you get a device that has a wide range of all of these important elements. 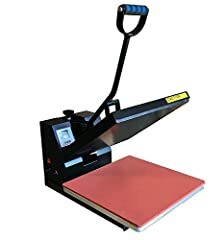 Even if T-shirt printing is just a hobby, you do not want a machine that will apart on you after a short period of use. Look for a machine that has quality components made out of metal. A good rule of thumb with heat presses is that the heavier it is the more durable it is. Finally, when you come close to selecting a press, read online reviews from actual purchasers of the machine. 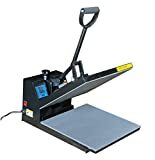 Some T-shirt heat presses are very easy to use. So easy that a child could probably use them (though this is not recommended because of the dangers of getting burned.) But other presses are quite complicated. Before you buy a press, make sure you understand how it works and that you are comfortable using it. Also, make sure that using the device won't be too stressful on your back. 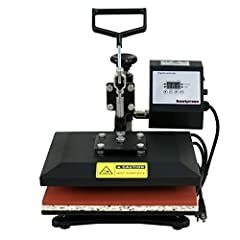 Not only do you want a T-shirt heat press that comes with a warranty, but you also want one that provides human technical support. You want to be able to speak to someone if something goes wrong. New: Our editorial list of additional articles. We decided to gather informartion all around the internet and present you a list of helpful, external links to interesting reads about the best t-shirt heat presses and their reviews and guides. 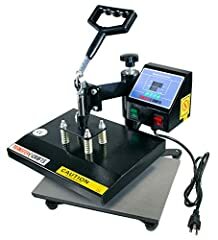 You're not convinced by the previous writings about t-shirt heat presses? Of course you can just choose by visual impression, that's why we present you all our chosen products at a single glance. A click on any image is enough to open an external link to the best offer we could find. 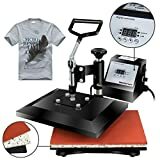 Finally, we want to present you our rating criteria for our t-shirt heat press comparison, so you can better understand and comprehend our recommendations and the rating process itself. 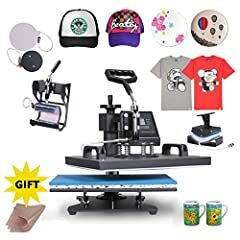 Furthermore, we still ask you to keep your eyes open for short term deals in order to make some great bargains with t-shirt heat press in 2019. Published by G. Krambs on StrawPoll.com (last update on 2019-04-19 08:01:18). 20 of 31 readers found this article helpful.